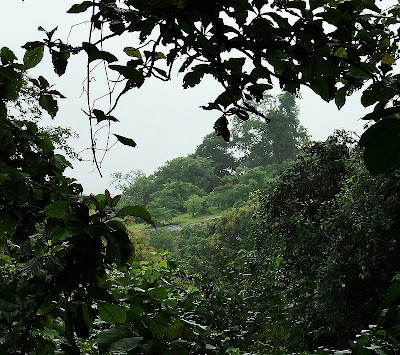 Yeoor Hills, a part of the Sanjay Gandhi National Park is a semi-evergreen, deciduous forest that harbors a myriad of life forms. With life teeming in its every corner, Yeoor, being a land of constant stress from humans, still has places left that would righteously be called the untouched lands. The farmhouses are ever increasing, and so are cattle, but that has not stopped its original inhabitants from not showing up. Yeoor is accessible by road until the top, to a village called Patona Pada. Joggers track here, up and down in early morning, and friends and families flock here to relish the fresh air and greenery. However, the real, wild Yeoor begins from where the tar road ends. We walked into the wilderness with high, deserving hopes, and I had specifically come to see some Skippers, but there was more to the show! 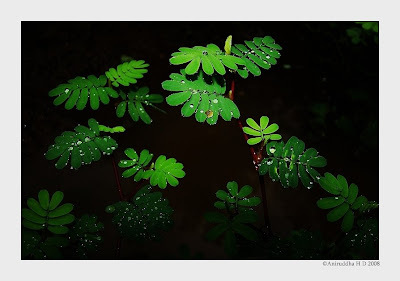 The rain had been very irregular, scant rain treaded us as we trailed early in the morning, and then it opened. 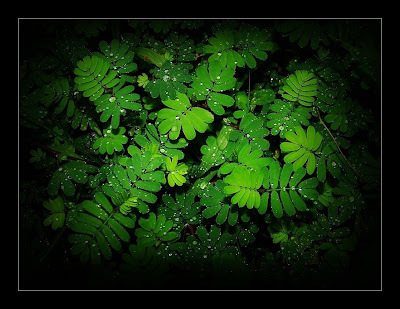 The clouds tore apart and gleam of sunlight fell on the leaves. 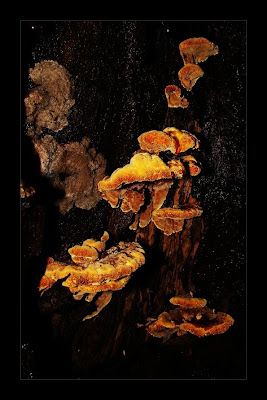 As the air grew warm, so did the other creatures and we had helluva sightings! It sometimes poured heavily and all our hopes were drowned in the rain, but that did not stay for long! So all in all, it was a great day and a great watch at the macro world. How do you see such teeny weenie creatures, ask people. Well, I say look around, turn a leaf! And that’s what we literally did. We turned leaves, and they were there – waiting for us with exceptional poses and handsome looks! Although we were there for a pretty short time, I saw what I could have never imagined. Few I could photograph, many I couldn’t, but their glance was more than enough to rejoice, and what’s more pleasurable was running behind them, just to get a proper glance and if greedy, get a shot! 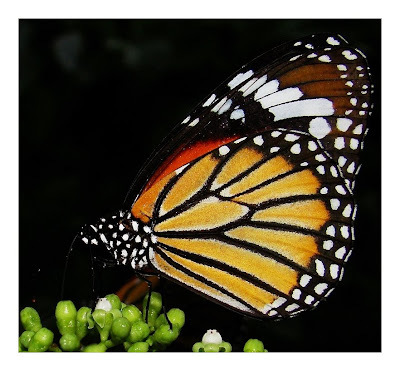 The insect sightings were superb, but again, blame it on to me – or us – for we hardly looked up for birds. Anyhow, we saw pretty nice birds, with a Racquet Tailed Drongos on a tree, mimicking calls of various others, even the Crested Serpent Eagle! We also saw Jungle Babblers, and we heard the Shama singing away to glory, saw Cattle Egrets hunting for insects on the plains. The butterfly sightings was fairly good too, with most of the commons everywhere, we could see a decent number of Skippers too! The amount of photographic records was fairly good too. To watch butterflies, Yeoor is an apt place. 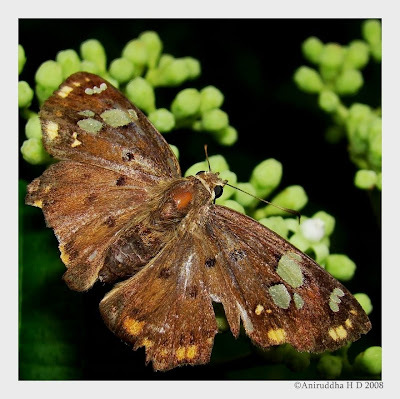 With five Skippers on the list, I’m sure had we explored a little more, we could have seen even more. But we had time constrains. 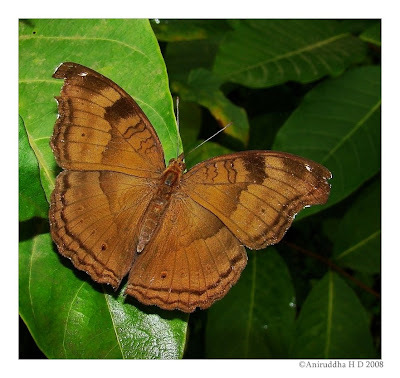 Anyhow, the most common, yet beautiful butterflies fluttered all around us. With sun showing up only for a while, no other Pansy but the Chocolate and Grey Pansies showed up on the leaves, basking as much as they could. Whats more, when the rain came down, the butterflies hid 'neath the leaves, and one such was a Yellow Orange Tip, both male and females, hunting for cover from the rain! Another treat to the eyes, the little Plum Judy with its ruby like colours. 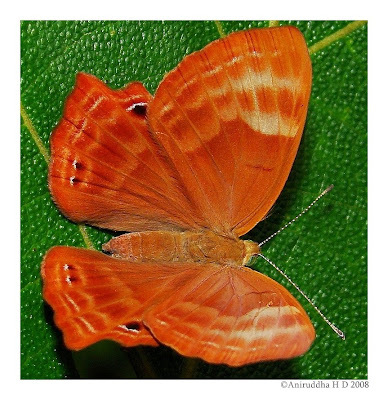 A brilliant shade of hazel brown, the butterfly has it's typical riodinidae posture of resting. It has a habit of 'dancing' around, just after it sits, and this is supposed to confuse the predators. 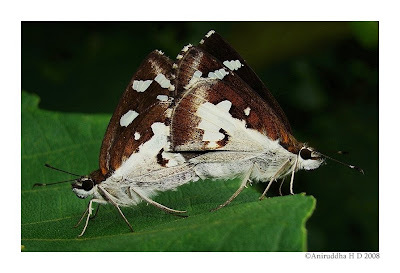 Now, the 'lesser' butterflies of the New World, or the Skippers were a cream on the pie. 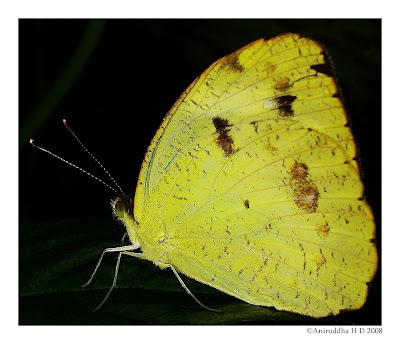 The Golden Angle was always with us, nectaring and fluttering along. When we proceeded ahead, we came across a superb Tri colour Pied Flat, but for my hard luck, the position of the Skipper was difficult to capture. However, another Tri coloured Pied Flat showed up where this Golden Angle was - although a bad specimen - but it was none the less a treat! 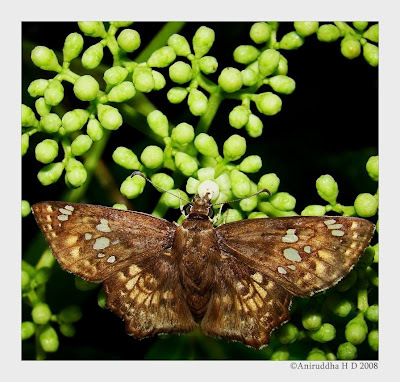 Out of nowhere, we noticed a hyper butterfly - a skipper for sure - that had no intentions on his mind but to startle us. On a closer inspection it was figured out to be a kind of a Snow Flat, a unique Heisperiid! But unfortunately, we lost it in the forest. 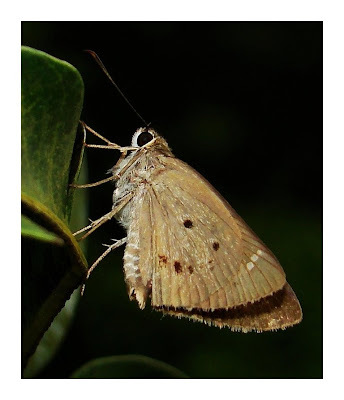 Then we saw another Skipper, which we were doubtful of it's ID, but it was an Indian Palm Bob. Lastly, from the Lepidopteran world, we saw lots and lots of Grass Demons in every nook and corner of the forest bed, but they were very active and would not pose for photographs at all, and while I was shooting a spider, a pair of Grass Demons was right below, mating! We also spotted a Slug Caterpillar. A Caterpillar that doesnt look like one! 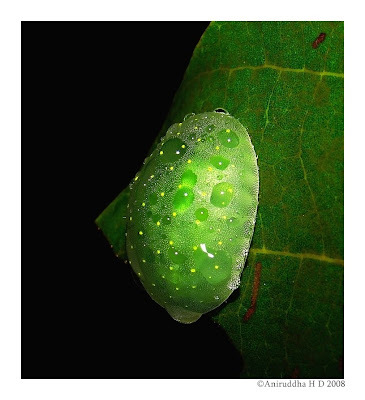 This is is a cute and cuddly greenish - jelly like - caterpillar that of a Limacodidae moth. There are a variety of Slug Caterpillars, and this one is one of 'em. There were many of these, and other Uraniid Moths. What a great day! It doesnt end there, there's more... other than these scaly winged beauties, there were other little wonders of the macro world, and below is a Leaf Hopper of family Cicadellidae. And again, not just that, there's more to than this. 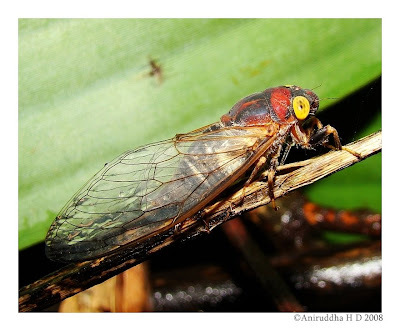 We saw the representative of the Cicadellidae family, a Cicada - and a colourful one at that! 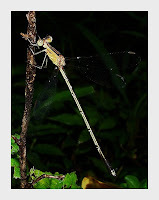 We spotted a variety of Dragonflies (Odonata, Anisoptera) too. 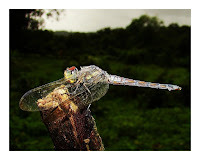 A Wandering Glider was commonly seen wandering, a Black Marsh Trotter was perched high on a branch, a Ground Skimmer, a Slender Skimmer and an Asiatic Blood Tail female were also seen, along with a Damselfly (Odonata, Zygoptera) an Emerald Spreadwing. 1. Ground Skimmer; 2. Asiatic Bloodtail - Female; 3. 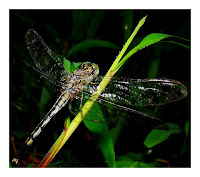 Emerald Spreadwing respectively. 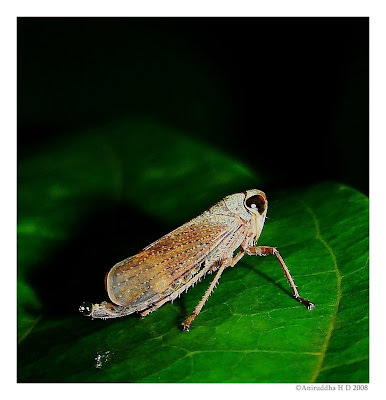 While hunting for Butterflies, a friend came across a cute li'l creature - a juvenile Grasshopper (Orthoptera). 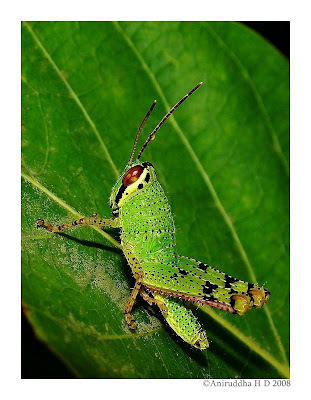 There are very few common names to grasshoppers, and less work has been done on a general basis to name them. 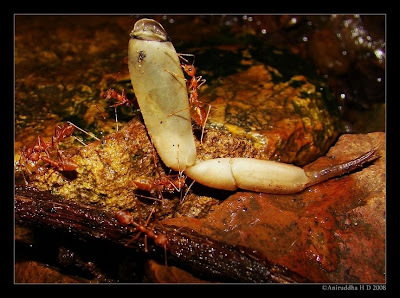 Finally, other than these Arthropods, we saw another kind of an Arthropod, a distant relative of the Insecta - the Arachnids. 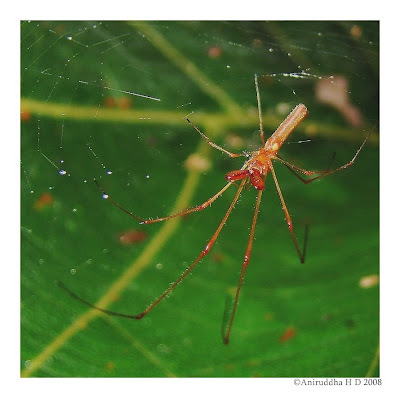 We saw a fair variety of them, with a Signature Spider (Araenae), Lynx Spider (Oxyopidae), a Long Jawed Spider (Tetragnathidae), Giant Wood Spider (Nephila sp.) 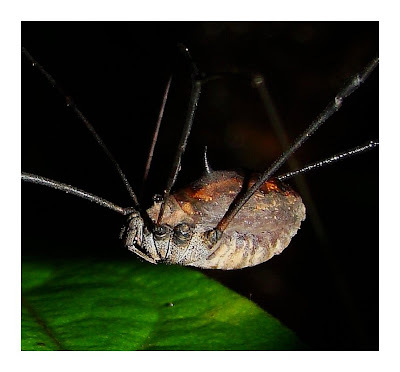 and a Harvestman (Opiliones). The Lynx Spider was the most colourful of all, and posed nicely! Here are the dorsal views, which look like these are male and female. Both were on different plants. 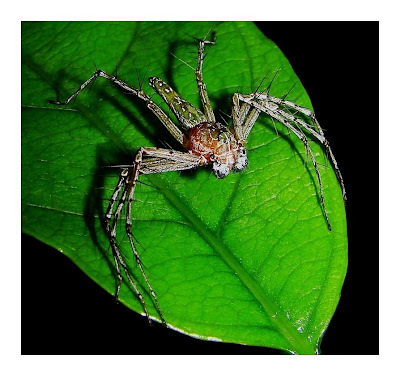 The other Spider, a Tetragnathid, known for it's large jaws, slender abdomen and very long legs, cast it's web across a folded leaf. 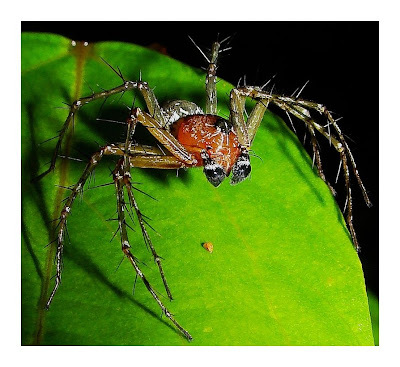 Commonly known as Long Jawed Orb Weavers and Stretch Spiders - since they stretch their legs in a defensive posture. Lastly from the Arachnids, a Harvestman (Opiliones) - the indicator of a healty habitat - was seen hiding from the rain. 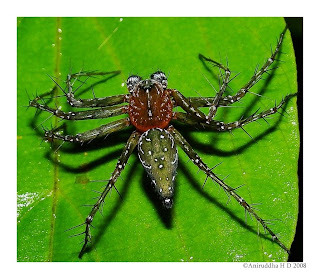 Although not a spider, it is a cousin of the Araenae. 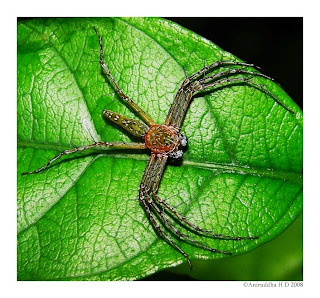 It is identified by its extremely long legs, and a dorsal spine - seen in the picture below. The picture is a tight crop, however the spine is clearly visible. Some have two of these, while many have a single one. We also saw an interesting activity under our feet. A group of Fire Ants attending to a huge dead Land Crab. A scout was attending to the Crab's main body where as a few workers were busy carrying a heavy spider leg! Last but not the least, we saw many swarming Millipedes and Molluscs (Snails).